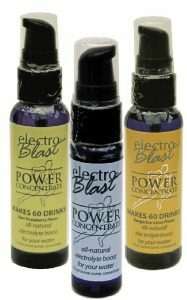 electroBlast.com Info – Pure electrolytes – concentrated. Best available for your body and your brain! No GMO, No artificial anything. Convenient pump bottle makes 50 drinks! Do you have: Fatigue, Depression, Headaches, Poor Memory, Lack of Energy, Senior Moments, Muscle Aches, Dehydration? If so our multi-electrolytes can help! NO Artificial Anything – no sugar electrolyte supplement! The ultimate full complement electrolyte energy drink for stamina, endurance and neurotransmitter (cognitive) support! No sugar or artificial ingredients! More than just the sodium and potassium in many sports drinks! Our multi-electrolyte formula supports the body and the brain! WE HAVE PROOF THAT ELECTROBLAST WORKS!!! See all 12 YouTube videos! Go to the Why electroBlast link on the menu bar. *For the average person, our 2 oz. bottle can usually last 2 to 4 weeks depending on variables such as frequency of servings and number of pumps. For athletes, sports enthusiasts, pilots, people suffering with serious health problems and/or others, our 2 oz. bottle will be used up faster because of increased frequency of servings and number of pumps. Click on the menu item "Products" to choose your favorite electroBlast. Lots of electrolytes in tiny bottle!